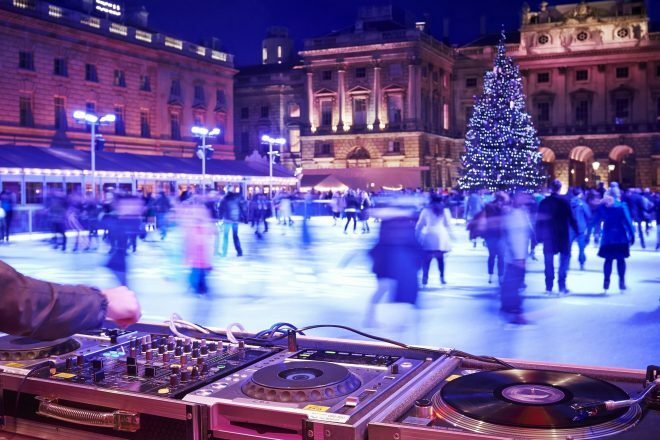 Somerset House has invited a whole host of DJs, artists and collectives to its iconic courtyard ice rink this winter to transform Skate at Somerset House into a late-night dance music destination. So far this winter Skate Lates has welcomed the likes of Gaika, Rock The Belles, Nightwave, Plastician and more. Elsewhere this season, Dalston Superstore will take over Skate Lates for the first time on December 12, while London selector Josey Rebelle is set to hit up Somerset House on January 10. Other highlights include a Jamz takeover on December 14 featuring Jamz crew Elijah & Skilliam alongside rising star L U C Y. Sink The Pink have also been locked in for a very special New Year’s Eve takeover. The legendary LGBTQ+ crew will perform on a stage over the ice-rink, while Sink The Pink co-founder Glyn Fussell and co-founder of The Glory John Sizzle will act as the evening’s hosts. To grab tickets or find out more about Skate at Somerset House, Skate Lates or Sink The Pink’s NYE takeover head over to the Somerset House website.